Titanfall 2 first DLC map: Angel City, launches on November 30 for pre-order customers. Respawn Entertainment drastically changed its DLC policy with Titanfall 2, promising to release all post-launch maps, and a lot of other content for free. The first of those maps, a remake of Titanfall 1's Angel City, is being prepped for launch this week as part of the "Angel City's Most Wanted" DLC drop. 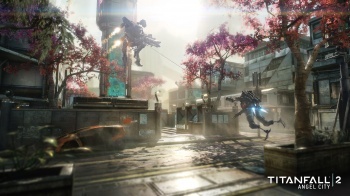 Gamers that pre-ordered Titanfall 2 will get access to the Angel City map starting on November 30. All other players will get access to the Angel City map starting on December 3rd. If you're raising an eyebrow at the in-game store, Respawn explains that "In addition to the free stuff, we will be opening a store in game with the launch of DLC #1 that will allow you to purchase new skins, camo and Prime Titans if you want for a modest price. We will have no in-game currency exchange." In a cheeky jab at titles like Overwatch and Team Fortress 2, it says that there are "No locked loot boxes, crafting shards or pay-to-win weaponry. No RNG. If you see something you like, you buy it and that's it." You can read the full details of the update, as well as the company's plans for future updates, in this blog post. I wonder what a Prime Titan is. If its not gameplay oriented, but its not a skin. I guess it could be a whole model revamp or something. Titan Kits are alright, but I was hoping for alternate loadouts more then single perks. wow, and im still not able to play the MP properly because for some reason my ping is constantly over 3000 while other games dont have it that high. Prime Titans are much like "Elite" versions in other games in that they have new animations, a fancier model and texture but are functionally the same Titan. Have you tried switching servers? One of my coworkers bought the game and for some reason it had him tied to a EU server instead of a US one. how do i do that? i live in australia, you expect the game to do that automatically. In the main menu you should see which server you've been allocated to and the server ping. I'm in Aus same as you and my local one is the main Sydney server with a ping of 33ms (my typical ping for most games). You can click on the server name to change but it should pick out the best one by response time so see which server it has picked out for you and if it's the right one check the ping. If it's abnormally high could be something on your end. i see nothing in the menu or anything you have told me. all i see is what mode i like to play and that it searches in my area. but looks like telstra is having issues again. even having NBN, things arent smooth anymore as it was. now even others who use the network feel how slow it is. I'm on PC so it could very well be that you're on console and you don't get to choose servers, if you're not then I'm not sure what to do as it's there plain as day for everyone. im on PC only. i saw now what you mean. its also set to sydney. no adelaide or perth. and my ping is still over 5000. just unplayable for me.